Decide whether you want realistic, or unrealistic enemies and where you want them. Do you want realistic animals roaming the land such as Black Bear, Coyote, Polar Bear, Cougar, Gray Wolf, Bobcat, Grizzly Bear, Wild Boar, Tiger and more or unrealistic creatures. I chose "No, I want natural predators. Such as Bears, Gray Wolf, Wild Boar, Cougar, and more. Basically realistic." The reason for my choice is due to this. I have wanted a Survival based on Nature, based on Survival. Not against unrealistic creatures, but against realistic predators as it would be interesting, fun and unique. No other game has tried to create a Survival game based on the Wild. Rising World would be perfect to have realistic predators, the game will still be fun as there are countless natural predators out there. I voted for the second - "monsters everywhere" - because I'm thinking more on the Minecraft + Dragon's Dogma line of thinking. Maybe not exactly everywhere, just in a way that makes them realistically plausible. If there was a shadow they wouldn't really pop out from there, only in places somewhat away from the player. Real creatures should roam around everywhere, day and night. Monsters should be able to pop up (naturally) from their given surroundings during the night, but not from any random shadow. We won't have zombies or mutants so that's a breath of fresh air. Dragon's Dogma had night creatures done interestingly, though stupidly kept them in predictable places. Phantoms would roam dense forests, ghosts for graveyards (idea from this forum), and anything else that I can't think of being in their other areas. They shouldn't pop out from the shadow, or darkness, like mobs in Minecraft do. I wonder if it sounds contradictory because certain conditions have to be met from what I'm suggesting because that doesn't really give them many places to spawn, which also might be what some people are seeking. I'll still love to see the natural animal predators roaming about. I'd also love to see monsters 'everywhere' in that they come out of random, yet semi-specific places. Some even to their biome. The post was edited 2 times, last by ArcticuKitsu ( Feb 7th 2015, 6:24am ). So what you are saying is. Have Realistic Creatures on the surface and unrealistic ones in Hell and in Dungeons? I CHANGE MY VOTE TOO "Only have Monster's in dungeons and hell, the rest realistic!" It keep's BOTH people happy. Not sure what the devs are thinking, but that would seem to be the 'best' way to do it. Have overworld spawning be similar to how those Phantoms are spawned in Dragons Dogma in dense forest and ghosts in graveyard type thing, but able to freely wander around to suit their desire and needs until dawn arrives. No monster should spawn in the shadows of a home, cave, or the like unless absolutely necessary. It can do whatever it wants in hell in my preference, but the devs can easily over-ride that easily. My 2 cents though XD. The post was edited 1 time, last by ArcticuKitsu ( Feb 7th 2015, 8:08am ). Sorry to say this but this poll is a bit silly. Monsters are planned... even found stuff relating to them in game files. But there will be options to not have them so, either way people will be happy. I already started a thread asking devs where they planned on spawning them and attempting to get peoples input on it, just an FYI. We shall see what the devs do with it since I didn't get an answer from them. I think it will be a work in progress, not written in stone with the first monster in game. Haste is the enemy of knowledge. If biomes are properly implemented then game could have surface monsters while still allowing a non monster gameplay. Adding an expensive craftable item that despawns monster type A and spawns monster type B in its place could allow the player to choose the genre. Play balance and immersion are broken if you're building a modern mansion and a horde of medieval goblins attack it. (Perhaps all the modern stuff will count as placeholders for magic stuff later one.) A robust peaceful mode will help resolve the debate I suspect. I wish I could read german now. Missing so many answer in english. It is just to get a general idea of what people might want. Yup but we're getting duplicate threads which in general give devs a headache. Regarding monsters. Well yes for sure in dungeons... but also world generation should be able to make caves, lairs etc.. along with the temples and ruins on the surface. I see no reason why monsters should be there also. I mean, why would they only be underground? Why would wolf protect a temple? Monsters should be on the surface also. This is my opinion after much thought since the thread I made about this. Just makes sense. And of course we will be able to turn monsters off via config etc.. But in that case, why not just use creative mode? Anyways..
Having Monsters in Dungeons/Hell and realistic animals such as bears on the surface is a good idea. Some people want a realistic feel to the game whilst others want Monsters. To keep both of these people happy, doing that idea would suit them both and be fair. The post was edited 1 time, last by Ethan ( Feb 8th 2015, 1:12am ). Actually, it is quite logical if you think about it. Dungeons and Hell should be filled with Monsters whilst realistic animals roam the surface and some caves. Why? Well, some people want just a realistic experience in Rising World while others want some Monsters to keep the game interesting, so doing it that way would make both types of people happy. Understand? i voted no.keep it realistic. My RISING WORLD Let's play on YouTube! I hear ya man. And I thought that way before. But then there will be temples and ruins, special places like that which it seems logical that there would be monsters lurking there. Doesn't make sense that a bear would live in a temple. But again, we will be able to turn monsters off. Thus making everyone happy. To be clear, I would not want to find monsters roaming around on the surface like out in the open (aside from the ghost idea). Just in temples, ruins and other structures which are basically surface dungeons. To be clear, I would not want to find monsters roaming around on the surface like out in the open. Just in temples, ruins and other structures like that which are basically surface dungeons. Forget about MC. I can't see the devs copying what MC did. Why not have structures on the surface which you would explore at your own risk for loots like tech or resources etc..? Why would they only be found underground? Why would there be temples if there is no lore? Dungeons are fine as it adds a lot of fun when mining and such but temples are just a stupid idea to be honest. Why would there be temples if there is no lore? 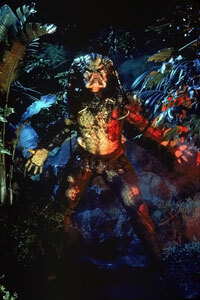 What about this kind of predator?